You’ve read somewhere how crucial blogging is for your business, and it’s true. Blogging is a powerful way to boost your marketing and connect with your audience. If you don’t have one, learning how to blog is paramount. 53% of marketers say that blogging is their top priority. Without it, you’re risking your SEO to crawl. This will result in bad visibility and even low traffic and leads conversion. Why are some people afraid of starting their blog? That’s because they’re afraid of failing. We’re stopping this nonsense now. In this article, we’ll cite the best first blog post examples that you can use as a guide. These examples have elements of how your first post should look like. We want you to see these blog writing examples and gain that much-needed confidence. These will help for that smashing success blog you want. Being informative in your blog is something that every aspiring writer should remember. The free-flow of valuable information is crucial to any blog post, as people need to see value in your blogs. One of the smartest examples of this is marketing guru Neil Patel and his personal blog. It’s a treasure trove of information for anyone learning about digital marketing. Neil’s blog has become one of the most respected resources on the internet for his informative takes on hacking online growth. While we don’t expect a new blogger to have the research tools that Neil has, what you need to do is research. Whatever your topic is, you want to make sure you’re a consummate professional. Learn the basics of your niche first and try to generate your own takes. 99% of the time, nobody on this known Earth can start their first blog post like how Neil does his. Even then, good valuable insights here and there will help for sure. When it comes to your blog, people don’t like stiff tones. The aim of a blog is to connect you and your business to your audience. If you want people to respond better, it’s best to have a conversational tone that humanizes the blog itself. One of the great blog post examples we like is Mike and Steph’s I Am A Food Blog. Their travel and food blog specializes in everyday eats and their adventures together. The content is both fun, easy and their content is fantastic. What sets them apart, however, is how they approach the reader. Their conversational take on their blog examples draws the audience in. It makes sure to remind readers that there is a human behind the brand. They treat their audience like a friend who’s visiting their home, and this makes their blog captivating. With a good command of their images and a minimalist layout, they’re making waves in the blogosphere. Don’t be afraid to be funny, witty and eloquent on your first blog. Even if you’re discussing serious topics, professionalism and being conversational do mix. It paints a more colorful palette and opens your thoughts to your audience. In formal journalism, the human interest story is an excellent take on how to draw in attention. What happens to real people evokes natural curiosity and can get anyone’s attention. In the same way, you would want a blog post that uses core storytelling to pull in your audience. One such blog writing examples is Feature Shoot, a photography blog that explains the context of the photos they post. Every post they do has a core story – a core theme that aims to evoke emotions in their audience. Many of the images they post are modern photojournalism at its finest. When it comes to writing your first blog post, start with a story that is personal to you. Use core storytelling as a way to humanize your subject and put it closer to the hearts of your readers. Whatever topic you may have, it’s crucial to have a certain level of narrative sense. Even if your topic is personal finance or marketing, there’s a logical flow to every topic. Try to figure out where your narrative flow starts. As examples, SEO for beginners and PPC guides tend to start with keyword research, as you can’t do anything without it. Core storytelling works and you should start doing so in your blog post examples. In your first blog post, it’s best to use different ways to break apart your content. People don’t like reading a wall of text, so it’s crucial to adjust your blog into easy to consume, bite-sized pieces. How do you do this? Our favorite of our blog writing examples for this is TechSmith, a technology blog that provides tips and tech how to’s. In all their blogs, they follow a specific guideline when it comes to breaking apart their content. What they first do is use short paragraphs with 1-3 short sentences. These paragraphs are all easy to read and have good spacing between them. They also use lists and quotes to make their content easy to digest. In their blog examples, TechSmith uses photos and videos to break apart their sections. Every section has a subheading as well to show a clear hierarchy between their sub-topics. The best way to do this yourself is to make use of lists to enumerate. If there’s a crucial quote, use the quotation button to emphasize it. Find photos that you can use as well, whether they’re stock photos or images you took. Follow These First Blog Post Examples! When it comes to your first blog post, there’s no need to muss. You want to be informative and compelling in your first blog post examples. You would want to make sure you provide value to your readers and find ways to attract their attention. Don’t have time to do blogs? Are you looking for ways to get content while you focus on the business? What you need is iWriter. 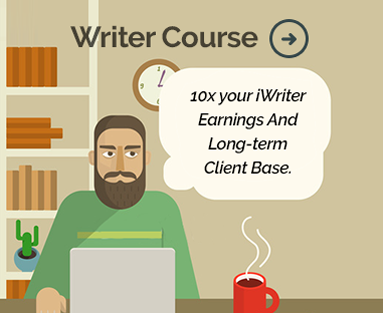 iWriter is a prime source for top quality content for any business. It doesn’t matter what your business is. We can provide compelling content that converts. Talk to us now and we’ll get you the superb content tailored for your business.